As I lay on the pavement, fresh off another trip over my handlebars, I couldn't help but feel embarrassed. I couldn't feel much else, as I was numb from my face down to the end of my left arm. I initially masked my embarrassment with anger, as I was prone to do as a previous version of myself, yelling profanities at the universe for wronging me and causing me pain. The embarrassment and shame came on in an instant. Only moments before I was feeling triumphant, and euphoric as I approached the turn onto Stuart Mesa. I had only a little over four more miles to go on the bike leg of the Semper Tri Triathlon in Camp Pendleton, and I was doing very, very well (I would later learn I was in about 5th place in my age troup). Then, BAM! My race was over. Leading up to that point, I felt great. I arrived at the Marine Corps base at about 5:30 am, racked up my bike, and made sure I knew where the bike and run exits were (didn't want to make the same mistake twice!). The setting was really fantastic. It was a very large hangar for Hovercraft and other naval vehicles. The large, open expanse of concrete was today interrupted by a set of cones outlining a bike and run course, and a series of tents populated with Marine recruits, eager to practice their medical skills on civilian triathletes (I would be visiting them later). Down a wide, endless ramp toward the sea, the triathletes set up in transition. Beyond the ramp, a set of what can only be described as concrete sand bags lead to about a hundred yards of sand, and then ocean, which today was breaking at about 3 feet. I donned my wetsuit, and headed out to the water for a brief warm up swim. The water was quite chilly that morning, but I was able to get warm pretty quickly (through movement and other natural means). Then it was out of the water to wait for my wave to start. I could see far away on the bluffs the multitude of spectators, three of which were my wife and two children. I couldn't see them, so I know they couldn't see me. No matter, the swim would be a quick 500 yards, and then off up the beach toward my bike. My goal for the swim, as was for much of the rest of the race, was to be more aggressive, as I felt I could have been faster in the swim and bike back in Carlsbad. And that's what I did here. I lined up in the middle of the pack at the swim start and ran into the water (rather than jog) after the gun went off. I was in about the middle of the pack for most of the swim, and was able to pass a couple people on the parallel leg. On the way back in, I was able to sight the chute and swim toward it. Closer in, I saw a wave and was able to body surf in, passing a couple more people. I ran up the beach, and was clearly winded at this point. It is no easy task getting out of a fast swim and then running up a sandy beach, so I held back a little more to get my heart rate down. Into transition, and I briefly ran past my bike, but caught myself quickly, removed my wetsuit, put on my shoes and helmet, and set out for the bike. At the mounting point, I jumped on and took off. 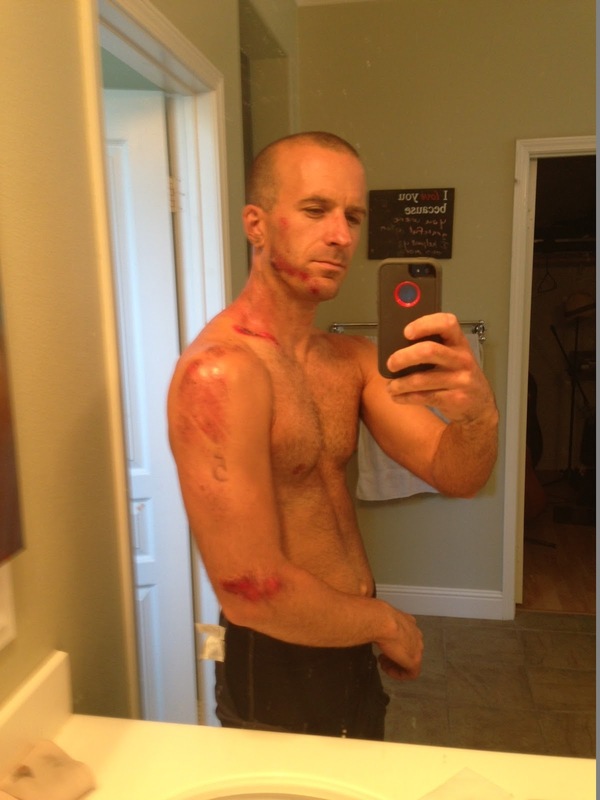 Again, my goal on the bike was to push a little harder than I had in Carlsbad, and that I did. I immediately and continuously passed other cyclists on the way out toward Stuart Mesa. About a mile in, I had passed a lot of cyclists and the road opened up, so I took advantage and kept my pace high, while taking in Gatorade and Gu to keep my energy high for the run. Once I turned to climb up Las Pulgas, I had reached the next group of cyclists, many of which were in the previous waves, and some of which were faster cyclists in my age group. It was clear now that I was among a more aggressive group of athletes. One such athlete (I won't mention his name or number), I saw was being very aggressive. While drafting is illegal, he would pull up to the rear wheel of any rider he was going to pass to get the extra speed to swing around them. I was able to pass him and leave him safely behind me, or so I thought. Sure enough, I felt him behind me and swing past me again, only to slow to a lesser pace than I was traveling. Thus I proceeded to pass him again. We played this game all the way up and down Las Pulgas, even though my only intention was to keep a steady pace. I was ahead of him, approaching the turn back on to Stuart Mesa. As you can see in the video below (toward the very end), we rode into a coned area, which separated the cyclists from auto traffic. A large truck was stopped to the left waiting for direction from the Marine traffic controller. A bit of miscommunication led the driver of the truck to think he was able to go on the left hand side. Unfortunately, that's exactly where I was going. This is where the deja vu kicked in, as I have some experience with cars turning right in front of me. I swerved and avoided the truck, but was a bit spooked as I approached the left turn. A Marine who was supposed to warn the riders of the tight left turn coming up was distracted with the task of trying to stop the truck from proceeding. I approached the turn fast, but also felt I had a good line into the turn. However, I didn't anticipate the same aggressive cyclist would be drafting me into the turn. I felt him on my rear and to the left, as if he was making a move to pass me. Had I kept my line, it was likely, I felt, that he would have caused us both to wreck. The lesser of two evils then was to give up my line, which made making the turn for myself less likely. You can see me briefly straighten my wheel and then hit the brakes, which forced me over my handlebars, face first into an eroded curb. Given that account, the embarrassment and shame sound like unreasonable responses to a situation like this. Pain? Yes. Anger? Of course. But embarrassment? I was embarrassed because I had been through this before only a couple months prior. Because one of the very purposes of this blog is to show how one can be healthy, happy, in service and injury free. Laying on the pavement in the middle of Camp Pendleton, I felt numb all over. With the extent of the impact, I was certain I had shattered my jaw, broken my collarbone, or worse. Obviously I had failed at the "injury free" part many times over, and my brain was making every effort to let me know this was the case. This is my brain's way of telling me "Wow, Adam. You really screwed up there. This sport really isn't for you. You just need to give it up. Obviously you can't do it." "I can't", or any variation on the theme, are two words that are often subconsciously conveyed to us at our most vulnerable and lowest points. Often too these words are manifested through the verbalization of acquaintances telling us that it might be best if we give up. There is one common truth, however; that regardless of where any variation of these words come from, they are only as powerful as we make them out to be, and only if we make them stronger than The Will that drives us will they succeed. I had been fortunate yet again to have not been more seriously injured. Upon reflecting on the indecent and finding ways to be grateful, I recognize that while (as my daughter said) I look like a cheetah attacked me, I walked away. My neck and spine were in good shape, nothing was broken, and I am still able to eat solid foods. Injuries - Like getting a really fast, aggressive tattoo. Some would say it's an improvement! One of the things I am most grateful for is my willingness to continue. After my initial bout of self pity, and after I was checked out and cleared by the EMT (after about a half hour in an ambulance), I was ready to jump back on my bike and hobble the rest of the way and finish the race. It has always been my goal to never give up on a race, but unfortunately the on site volunteers wouldn't allow it (and they had my bike on a truck surrounded by Marines). I am glad that at least I had that willingness not to give up, even if my chances at placing highly were gone. Before the race I saw many athletes (some soldiers) with missing limbs, and probably many others with less obvious limitations, and they were going to finish the race. I should never, ever give up just because I am in a little pain, or am doing more poorly than expected. Pendleton was also a learning experience. I learned that I need a renewed focus on humility. I am training for an Ironman which is an endurance race, not a sprint. There is no reason for me to be pushing as hard as I can in the sprints to place highly when my goal is to do well in an Ironman competition. More so, my goal is to continuously improve myself physically, mentally, and spiritually, which can't be done when my ego is active. When it comes to the bike leg, it is best that I keep a good pace, but let the aggressive riders have their day. I can always pass them on the run! To close out the race report, it is likely my bike time would have been between 50-52 minutes, and my run likely about 22 minutes (estimating from my experience at Carlsbad). For the record, the guy who forced me off the road finished in 7th in our age group. With the times above, I would have finished in 5th or 6th place in my age group had everything else gone well. Had that happened, perhaps my ego would have been inflated and I wouldn't have been reminded of my need for humility. Maybe it's for the best that I learned a painful lesson and remember this experience in future races, lest my ego get the best of me. The video reminded me of flying obliquely over my handlebars on a steep graded country road in England last year. An icy morning. I fractured a rib and had hairline fractures in my hands. Raw flesh wounds appeared on my face and arms too. It could have been much worse. No EMT or Marines though – perhaps the NHS and uncompassionate Brits to substitute. I experienced a definite feeling of humility also and I took what happened as God telling me to slow down. Caused me to re-prioritize the most important things in my life and focus more on family. One of many reasons why we’ve moved back to the US. You’re lucky this time again! Remember that you don’t have 9 lives and have a family that needs you around.